Hi @Fernando_Pereira – we’ve seen a good deal of stable upgrade to 1.3 on Linux, so something is different here. I’m sure once we figure out what that is we can get this stable for you. Why don’t we start by getting some more information here. Can you describe your setup (especially your storage devices) as described here? When you post that information, just write @support in your post to flag us, and we’ll take a look. Thanks for your patience! When I stop the core, copy over my backup database, and restart the core, I get a client message that it’s going to convert the database and it might take a while, but then immediately I get a screen with 0 albums, 0 tracks, etc. When I look at Settings>Storage, I see a “DirectoryNotReady” red note below my music folder info. I did not change anything. If I try to re-enter the SMB share info, the share is shown as empty, even though the share is not empty and contains the folders I expect when I mount it from another machine. It looks to me as if the information about the share is messed up and I cannot correct it. Several other users have reported problems similar to this that were resolved by restarting their Synology devices, could you try that? Restarted Synology, and recopied my backup database to the main place. The good news is that the Android clients are now seeing the library. The less good news is that the Mac client does not find the core. Both Mac and Android devices connect to the core via the same wifi network. Update: Mac finally connected, looks like the Mac client is less willing to connect to a very busy core (database rebuild) than the Android client. @support This is NOT resolved. Just now, the Roon app on my Macbook told me there was a new update. I (foolishly) agreed to do it. After the update, the Mac app was unable to contact the core on my Ubuntu NUC. I rebooted the NUC just in case. No luck. Worse, the Android app was seeing the core but no library! So, rebooted my NAS. Android app now sees the core and the library, but the Mac app still does not see the core. It is not acceptable that I need to reboot my NAS (which serves several purposes besides Roon) just because Roon Core is unable to manage its SMB CIFS shares properly. And the Mac app is still failing to see the core. Even rebooting the Mac made no difference. I have a tarball with the current core logs on Google Drive, if support wants to look at them. Update: worse still, without touching anything, now the Android app complains my library is empty. On Settings>Storage in the Android app, my library shows the error “DirectoryNotReady”. No, rebooting the NAS is no solution, I’ve done it already and it only “solved” the problem temporarily. I’m now convinced CIFS handling in 1.3 is seriously broken. Seriously, guys, this is unacceptable, the main reason I bought Roon was to have a more reliable streaming solution for my home. That issue was for USB drives, not CIFS remote shares. I’m convinced 1.3 has screwed up CIFS handling. My music system is dead in the water, and wondering what to do next besides wasting hours of my time rebooting things and reporting problems here. Not what I expected for $500. Latest update: I killed the 1.3 Core-Synology CIFS connection from the Synology Connected Users panel, and everything came back, both with the Mac and Android apps. Definitely looks like 1.3’s Synology CIFS share handling gets into a bad state. Never saw this with 1.2. Hey @Fernando_Pereira – can you let us know how things are looking with Build 196? @support Not improved. After I updated to 196, Mac would not see the core, and Android connected to the core but reported an empty library. I killed the core CIFS connection from the Synology connected users panel. After restarting the Android app, it connected to the core and saw the library correctly, but the Mac app is still not seeing the core. Killing the core>Synology CIFS connection again, or clearing the SMB cache, did not revive the Mac app. Update: Rebooting the Mac revived the Mac app. Looks like the Mac app gets stuck in a persistent failure state that can only be reset by rebooting the Mac. @support Further details: when I got back to my Mac client this morning, it reported that the library was (again!) empty. Killed the core>Synology CIFS connection. Library came back. Clearly there is a problem with the establishment and maintenance of the core-to-library-on-Synology CIFS mount. What can I do to help you fix this problem, which is really messing up with my ability to use and enjoy Roon? Hey @Fernando_Pereira – thanks for your patience here. We’re discussing your issue and trying to understand what makes your setup different from the many thousands of stable Linux Cores we’re seeing on 1.3 using similar configurations. Generally speaking, these are some of the most frustrating issues to resolve – when 98% of people in a given configuration are having no issues, problems with the remaining 2% are almost always environmental – a network setting, a bad cable, a failing hard drive, etc. Sometimes it’s a combination of a bug on our side combined with something unique on site, but it’s almost never something simple. We have a long track record of working at these kinds of issues until we pinpoint the problem, no matter how long it takes, so thanks in advance for your patience. First off, I’d like to get a look at the logs from your Core. Can you zip up the logs folder from your Core database and send me a Dropbox link to the whole folder? It would be great to know a rough time frame for when your storage configuration last went awry, too. Can you also let me know the Settings you’re using to mount your Synology? Obviously, I don’t want your log in and password, but a clear sense of the address you’re typing and steps you’re taking would be helpful, as I’d like to make sure the testing we’re doing in house matches what you’re doing as closely as possible. Thanks again @Fernando_Pereira – looking forward to resolving this soon! I have a similar setup, same problem. The easiest temporary workaround that does not require a NAS reboot is to go to the “Connected Users” widget and kill the frozen CIFS connection(s) from Roon Core by clicking on the (-) (wrong way sign) icon. Roon Core then reopens the connection and everything works again, for a while at least. My hunch is that the connections freeze when the NAS hibernates because the new Core software is not handling occasional latency/timeouts properly and marks the connection as not ready rather than retrying the connection. Thanks Fernando. Where is the “Connected Users” widget? Where is the “Connected Users” widget? 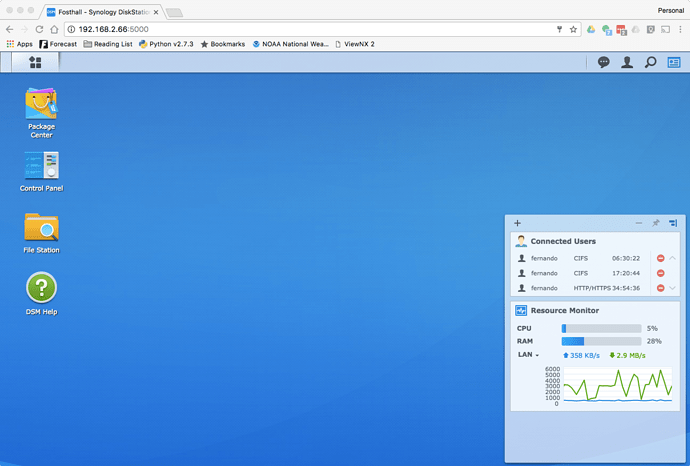 On the main page of the Synology browser interface, there’s a “Widgets” icon on the top right of the control bar. If you click on that, you can select widgets to be displayed, including the “Connected Users” widget. If you hover the mouse pointer over the user name for a connection in the widget, you get a pop-up with the IP address that opened the connection, which allows you to confirm if that’s the connection from your Roon Core. See the attached image. Hey @Matthew_Soldo – can you look over my post above, and get me some logs as well? These issues sound related, so I’ve merged the threads here. Sent you the info you requested (logs + NAS config) as Google Drive links (don’t have Dropbox). Yet another baffling failure. Controlling the core from my Mac, playing on one of my systems. But Android app (build 196) on my Nexus 6P Android 7.1.1 is stuck trying to talk to the core. After clearing app data, I get “Choose your Core” with the actual core, but it gets stuck in “Initializing…”. But the core is still speaking to the Mac app, which shows everything as working. Rebooted the phone, and the core shows up as ready. I’m forming a more complete theory of these failures: core state transitions are not being tracked correctly by client apps, with the result that the apps believe the core is not ready when it is actually ready. Yes I believe you are right . I have same problem .